Does the delivery date refer to the date the car was fully manufactured at MBIL plant locally or is it the date the CKD kit/chassis was built in germany for further assembling in India? I have booked a Honda Jazz. Will greatly appreciate if someone can help me understand if VIN and Chassis No. 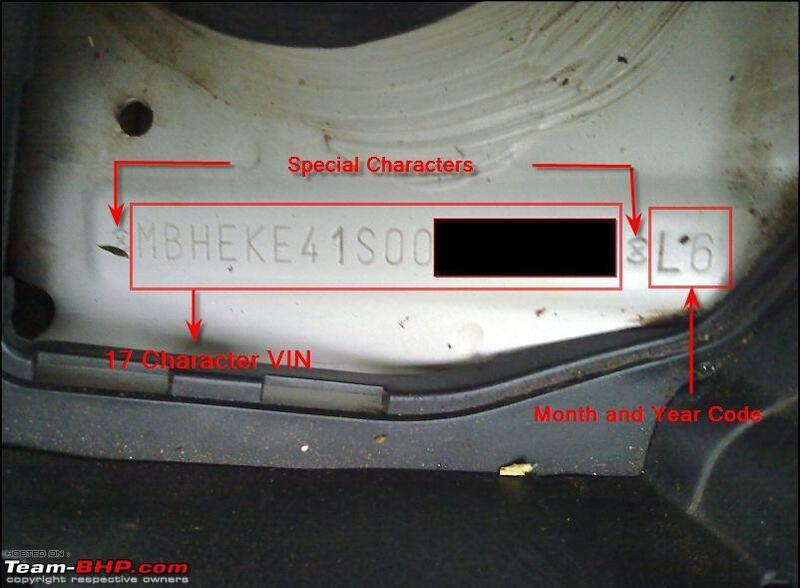 are different things on Honda Jazz. How to locate these and Engine No. 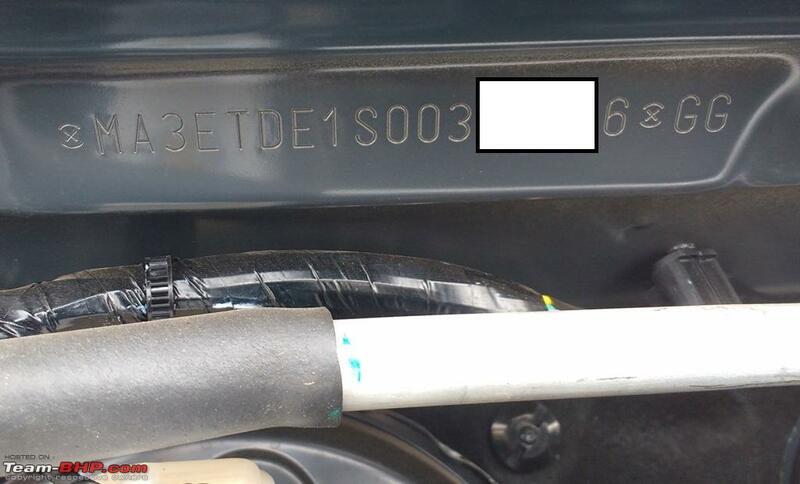 on the vehicle during the PDI? Looking for pictures if possible. Thanks. Last edited by morphique : 9th August 2016 at 07:54.
kkg, congrats on your latest purchase! 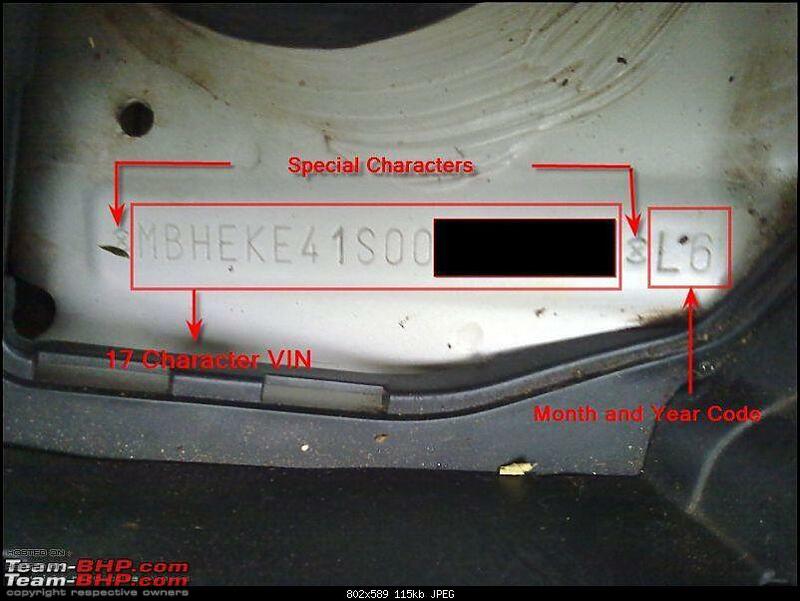 The VIN that you have mentioned in your post has only 17 characters (possibly from the bottom-left of driver side door); the complete VIN consists of 21 characters, where, the 20th and 21st character represents the month and year of manufacture respectively. 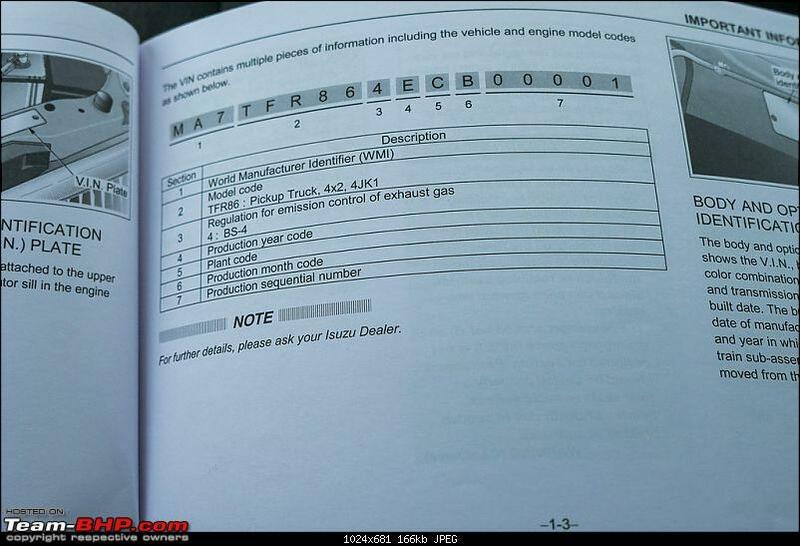 The complete VIN can be noted from the engine firewall. 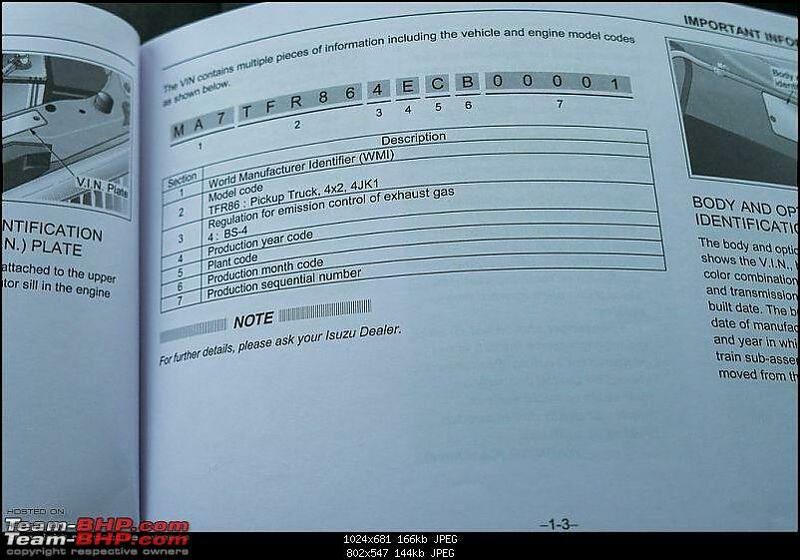 I guess that D13A5279811 is something related to engine, 1.3L engine?! Last edited by Tojo_GotBhp : 15th August 2016 at 18:31. Reason: Adding source. 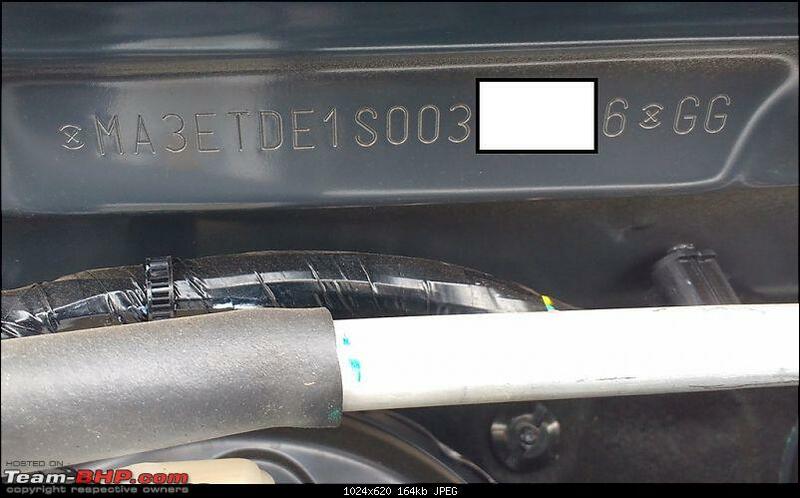 My situation with my new car booking which came with a VIN of Jan 2016 bring a question to light - when and where exactly the VIN number is assigned to a particular vehicle? In it's parent factory (ex. Germany for VW) / During assembly and testing (Pune for VW) / when it leaves for the dealer at the final stage (Pune for VW)? This could throw more light on what we could expect to be the lag time between manufacturing and delivery. Pardon me for not searching if this information is already here. My Son just booked the new Hyundai Elantra in Canada. Somebody tell me how can the year be 2017. Snap of the document attached. I did an online VIN Check and again it says 2017 as the year. Sorry for the poor photograph quality. My Son just booked the new Hyundai Elantra in Canada. Somebody tell me how can the year be 2017. Snap of the document attached. The 2017 refers to the model year (i.e. design/facelift) and not manufacturing year. This is a common trend in the west, particularly US and Canada. It need not match the calendar year. In the United States, automobile model-year sales traditionally begin with the fourth quarter of the preceding year. In the United States, for regulation purposes, government authorities allow cars of a given model year to be sold starting on January 1 of the previous calendar year. For example, this means that a 2017 model year vehicle can legally go on sale on January 1, 2016. EDIT: And congratulations to him on the Elantra. Father and son both staying loyal to Hyundai! Last edited by arunphilip : 5th September 2016 at 10:12. Kindly confirm if this is a July 2016 manufacture. This is for a Maruti celerio. Congrats! Yes, it's July 2016 model. The twentieth character 'G' represents the July month and the twenty-first character 'G' represents the year 2016. Thanks. Now that you pointed out suddenly realize the fact my daughter also has an elite i20. Hyundai family indeed. Sorry, if it has been asked earlier, but I am curious to know why the month and year of manufacture cannot be directly mentioned like manufacturing date? Is it just a lack of regulation/rules or there is some other reason to this? Guys I want to find out the manufacturing date of the Isuzu V-Cross allotted to me. I am not sure if manufacturing months is 8/6 or 4. The tenth character 'G' denotes the year of manufacture. So, it's a 2016 manufacture vehicle. Congrats on your latest acquisition. Last edited by Tojo_GotBhp : 19th September 2016 at 21:20. Reason: Broken HTML tag. I guess this is of a Maruti Suzuki. If it is, then it should have 21 characters, where the 20th character denotes the month of manufacture and 21st character denotes the year of manufacture. The VIN mentioned in the post has only 17 characters. The complete VIN (with 21 characters) can be found on the engine firewall. All times are GMT +5.5. The time now is 02:24.